With Bird Flu, 'Right Now, Anything Is Possible' : Shots - Health News An international team of disease detectives are in China to investigate an outbreak of a new strain of bird flu, H7N9. The biggest puzzle right now is where these infections are coming from, as testing poultry has turned up very few infected birds. A health worker collects pigeons from a trap at People's Square in Shanghai, China, earlier this month. So far, workers have tested more than 48,000 animals for the H7N9 flu virus. An international dream team of flu experts assembled in China today. 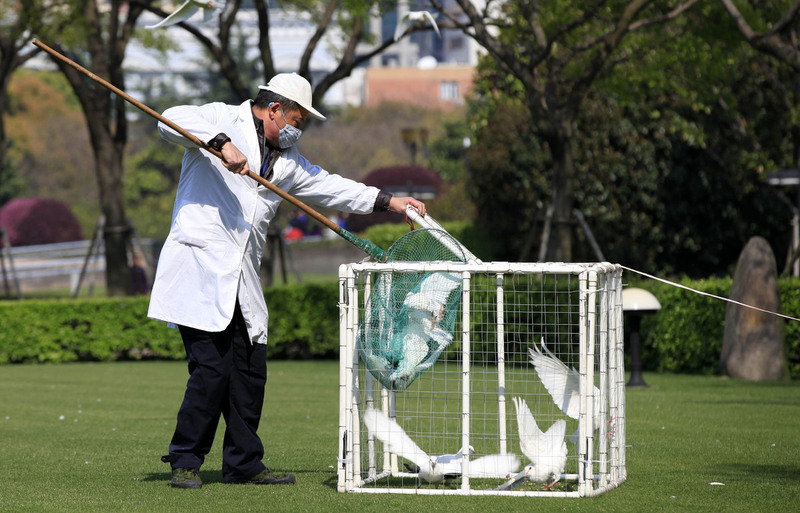 Underscoring the urgency that public health agencies feel about the emergence of a new kind of bird flu, the team is headed by Dr. Keiji Fukuda, the World Health Organization's top influenza scientist. Before he left Geneva, Fukuda explained the wide-open nature of the investigation in an interview with NPR. "The biggest question is just what's going to happen," he told Shots. "We've had a lot of experience in the last decade with new animal influenza viruses. But ... we haven't seen this combination before. So I think right now, anything is possible." "Anything" encompasses a wide range of possibilities. This H7N9 flu, as it's called, could follow the model set (so far) by H5N1 bird flu. It infected 18 people in Hong Kong in 1997, disappeared after being stamped out among the colony's poultry, then reappeared in 2003. Over the past decade, H5N1 has caused sporadic, limited infections among humans in Asia and the Middle East, affecting almost 700 people, killing 60 percent of them. Most troubling, H7N9 could become fully adapted to humans and touch off a global pandemic. The flu experts who arrived in China yesterday and today, and their Chinese counterparts, are confronted with an urgent set of unknowns. "Where is the virus?" Fukuda wonders. "Where is it keeping itself? How are people getting exposed to it? How are they getting infected by it? Those are some of the really basic questions that we're asking." Worry has increased recently. The virus has been found in two children in Beijing — a 7-year-old girl hospitalized a week ago who is recovering, and a 4-year-old boy who lived across the street. He is the first person known to be infected without showing flu symptoms. Other cases have recently emerged in Henan province south of Beijing. Both are hundreds of miles from Shanghai, where H7N9 first appeared last month. And they're far removed from other outbreaks. "The first thing [this] tells us," Fukuda says, "is that however people are getting infected — whatever they're getting exposed to — it's not just in one location, but it's spread out." Another mystery is what animal species are serving as the source of the virus. It's presumed to be poultry, but Chinese authorities and WHO officials say a significant proportion of H7N9 victims have had no known contact with poultry. So far, testing of nearly 48,000 animals — nearly all birds — has found the virus in only 39. 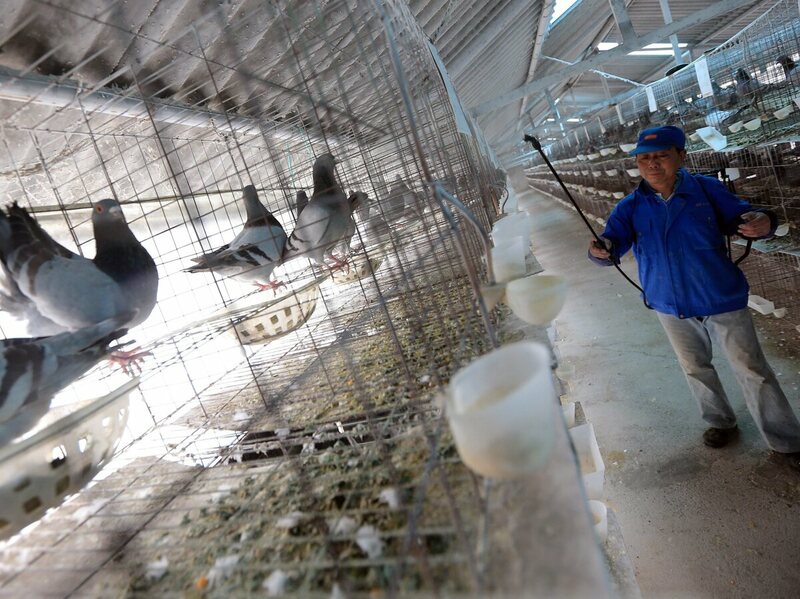 "There are very few positives for H7N9," says Dr. Juan Lubroth, the chief veterinary officer of the United Nations' Food and Agriculture Organization, based in Rome. "I would have expected maybe more hits in the poultry sector." Lubroth tells Shots that Chinese agricultural investigators took samples from bird markets, poultry slaughterhouses, poultry farms, wild bird habitats and bird environments. They also looked at pig slaughterhouses but found no evidence of infection. That's good, because pigs can be infected simultaneously with bird, swine and human viruses. The mingled viruses can swap genes, giving rise to new viruses that can spread among people. A worker disinfects a pigeon house Wednesday as a precaution against bird flu at XinRong dove-breeding factory in a suburb of Shanghai, China. But the search for the animal sources of H7N9 is really only beginning. Until last week, Lubroth says, animal tests for it weren't very reliable. There's a good test, but the Chinese haven't had time to distribute it very widely. "They have more samples than they have results," he says. Forty-thousand samples currently await analysis. The basic problem is that H7N9 viruses are tiny needles in a gargantuan haystack. There's no way to test every last chicken, duck or pigeon in the five provinces and two enormous cities where cases have been found. "The surveillance has to be very targeted," Lubroth says, "and because we don't have a lot of information, that target is quite dark." The usual tactic in this kind of situation is called "trace-back." That is, start with the poultry markets where people who got the virus shopped or worked, then trace the source of the poultry back to the farms where they came from. But Lubroth says many poultry-sellers don't keep good records. And asking them where they got their chickens often leads to dead ends. "They can shrug. They can say there's a middleman," Lubroth says, "and then you go to the middleman and he's not there anymore." Meanwhile, as the hunt is on for the virus's origins, scientists are just beginning to study it up close. Dr. Ab Osterhaus and his colleagues at Erasmus University in Rotterdam just got samples Thursday. He says his first priority is to develop a quick and reliable diagnostic test. "We want to be sure we can diagnose patients when they come from infected areas," he tells NPR. But Osterhaus and Erasmus researcher Ron Fouchier also want to figure out what genetic changes H7N9 would need to enable to spread easily among people. To do this, they want to do so-called "gain of function" experiments, splicing in genetic segments to see if they confer transmissibility. When they did similar experiments with H5N1 last year, critics said it was too dangerous, because a virus with pandemic potential might escape from the lab. But Osterhaus says the current situation with H7N9 flu shows exactly why these experiments are important. "We need to understand what makes these viruses transmissible," Osterhaus tells Shots. "I think that's quite important in estimating the risk in the future of these viruses that pop out in people." But Osterhaus says they won't do those experiments without a lot of consultation with fellow researchers around the world.